Join the big beasts on the great American plains in Buffalo Rising MegaWays. The number of symbols on the 6 reels varies with each spin. This can deliver up to 117,649 possible ways to win. You’ll also see symbol drop spins, transforming symbols and a free spins round with multipliers that increase with each symbol drop. Play on all devices from between 10p and £10 per spin. There are plenty of moving parts in a MegaWays video slot which makes design very important. If some other games in the MegaWays series have disappointed on that score, we have no reasons to grumble here. The reels are set against a canyon backdrop. There you’ll find a selection of royal values plus wild animals. In rising order of value are the moose, wolf, brown bear and buffalo. Land the buffalo symbol on 2, 3, 4, 5 or 6 adjacent reels for a payout of 1, 2, 10, 25 or 50 times your bet. After a winner hits, a ‘reaction’ takes place. The successful symbols are blasted from the reels and new ones drop down and replace them. The process is repeated as long as a new winning combination is formed. Helping to create those winners is a wild symbol that replaces everything bar the canyon and scatter symbols. That canyon symbol has some magical properties. When these hit, they all morph into the same matching symbol in the Mystery Symbol feature. A new payout is then made with the transformed symbols in place. Land a high value transformer or even a wild and some big results are possible here. Buffalo Rising MegaWays also gives the chance to buy the feature. How much it will set you back is displayed on the meter alongside the reels – it’s 100 times your bet. Some of the other MegaWays titles have left us slightly underwhelmed. Buffalo Rising MegaWays is a cracker though. The sound and visuals are nicely crafted and the changing game engine, symbol drops, transforming symbols and free spins with multipliers are a top collection of features. The medium to high volatility offers a chance at some chunky payouts too of up to 10,000 times your bet on every spin. 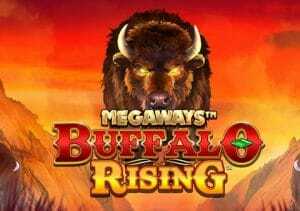 If you’ve never played a MegaWays video slot before then Buffalo Rising MegaWays is an ideal place to start.